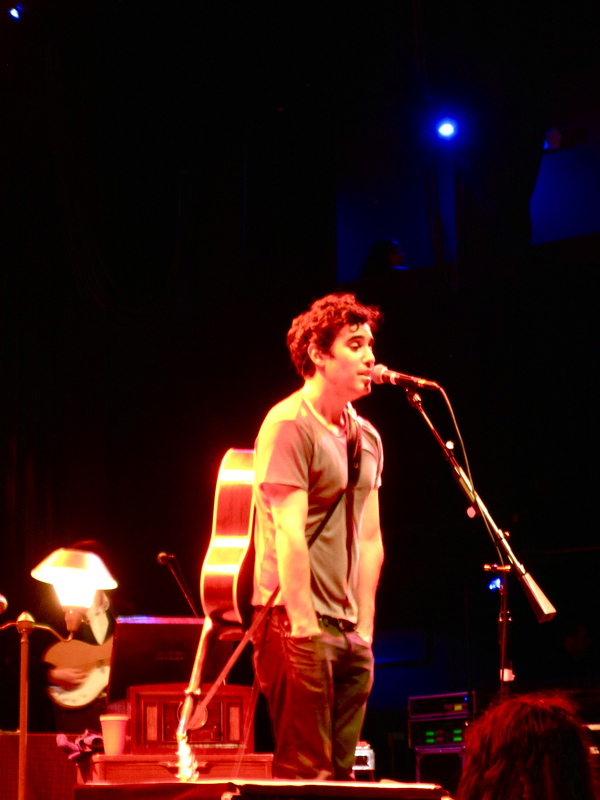 Last night I had the pleasure of attending Joshua Radin’s concert at the House of Blues in Boston. I’ll be the first to proudly admit I screamed a few “I LOVE YOUs” and clutched my heart in yearning as Joshua confessed his compassionate love stories on his soft acoustic guitar. Like most of my favorite simple acoustic musicians (Elliott Smith, Iron & Wine, Ben Kweller and Sufjan Stevens), Joshua Radin combines gently whispered vocals over a few wisely plucked strings on a high capo. Since discovering his lullabies, I’ve quickly ventured to master his uncomplicated chord progressions to satisfy my diverse young-adult moods. 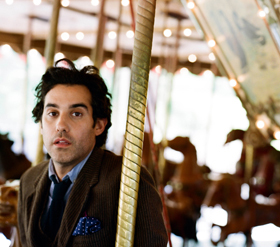 Northwestern University alumni, Joshua Radin embodies an older version of a Justin-Beiber-teen-heartthrob. Standing amongst the carefully staged, dim-lit romantic lamps, he prefaced each song about a failed relationship or dispirited ex-girlfriend. But probing deeper into every Boston college-aged girl’s ultimate fear; he described his mixed emotions watching his close friends happily settle down and have children while Joshua tours the world forever seeking love. Quietly speaking to the audience, Joshua confided his song “Everything Will Be Alright (Will’s Lullaby)” was written for a family friend’s seven-year-old child about growing up too fast. Joshua Radin’s music serves as the soundtrack for over 75 different film and television placements. Mainstream shows like 90210, Grey’s Anatomy, Scrubs, American Idol, Gossip Girl, So You Think You Can Dance and The Bachelorette have all featured numerous songs off Joshua’s three best-selling albums. In fact, Joshua Radin played five love songs during Ellen DeGeneres wedding to Portia de Rossi. 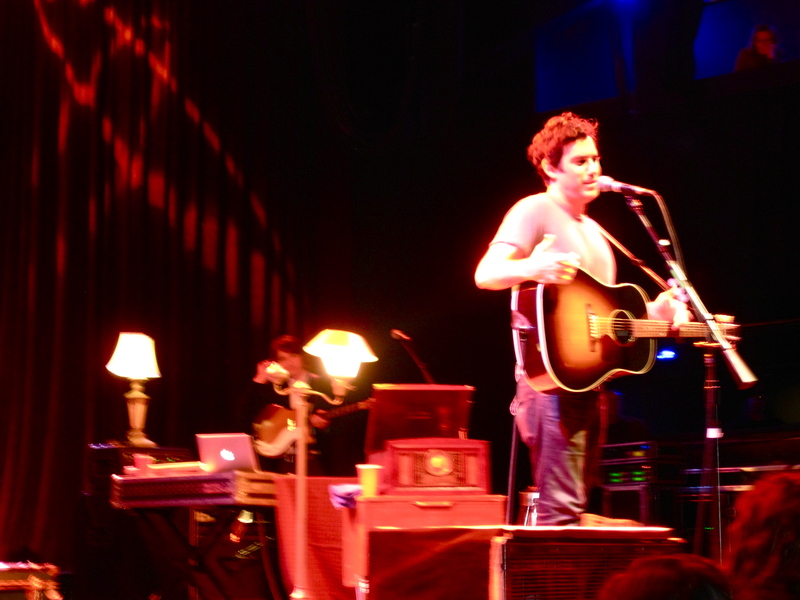 Joshua Radin’s House of Blues concert seemed genuine, yet rehearsed. Smiling at each girl in the audience (and the audience was mostly girls) his heartfelt stories touched a delicate center rarely scene in my recent fast-pace urban Boston lifestyle. Joshua went as so far to tell us the muse for his newest song “You Got What I Need” stemmed from his married friends difficulty conceiving a child; and needing inspirational ‘baby-making’ music. As much as I attempt to cling to my San Francisco indie origins of underground bands with small record labels, I have to admit: Joshua Radin’s breathtaking love songs are sure to heal any broken heart–“One of Those Days”— and inspire new love to once again bloom—cue upbeat and hopeful “Brand New Day”.